Bournemouth won the Championship title with a comfortable victory at Charlton, as Watford slipped up late on against Sheffield Wednesday. Watford had been on course to win the league but Atdhe Nuhiu's late equaliser denied them three points and the Cherries took advantage at The Valley. Two goals from Matt Ritchie and one for Harry Arter sealed the win and capped a memorable season for Eddie Howe's side. They finished a point clear of Watford at the top of the table. Bournemouth will take their place in the top flight of English football having been close to liquidation in 2008 and a game away from going out of the Football League in 2009. 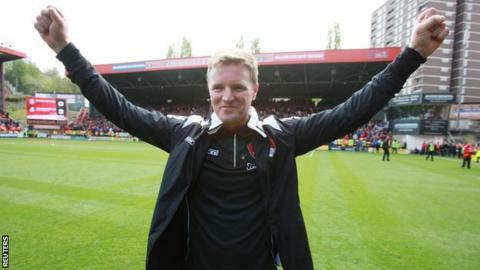 But under manager Howe, they have now earned three promotions, two of which have come in the past three seasons, and a spot in the top division for the first time in the club's history. Howe, 37, also joins a select band of managers to guide a team through the Football League and into the top flight, where they will earn an estimated £120m from their promotion. Goals have been a feature of Bournemouth's season and they were 2-0 up within 12 minutes at The Valley. Ritchie found the net with a stunning low 25-yard strike which cannoned in off the far post while Arter, returning to this former club, neatly placed past Stephen Henderson from the edge of the area following a defensive mistake. Roared on by the vociferous away support of 4,000 fans, Bournemouth continued to come forward in search of more goals. Charlton, who will end the season in 12th, improved after the break without testing Cherries goalkeeper Artur Boruc, while Ritchie's deflected effort came back off the crossbar. Bournemouth's fans chanted the theme music to Match of the Day and they were soon celebrating again after Ritchie's persistence saw him lash home from 12 yards. Moments later, the away end erupted again as news of Wednesday's equaliser filtered around the stadium. The final whistle at Vicarage Road confirmed Bournemouth's achievement, while the conclusion of their own game brought wild celebrations from supporters and players, with both sets of supporters applauding the Cherries on their lap of honour. Charlton manager Guy Luzon: "The table doesn't lie and in my view Bournemouth are truly the best team in this league. "They play great football with a lot of quality and organisation. They deserve to be in the Premier League and we wish them success. "I'm sure that if they continue in this way they will also have success in the Premier League." Bournemouth manager Eddie Howe: "You can see from my track record that the guys who have performed so well for us this season will get an opportunity to perform at the next level. "I don't believe in wholesale changes in the close season, I don't believe in not giving players a chance to show whether they are good enough. "Ultimately they will have to take that opportunity but it was the same from League One to Championship - we stuck with the majority of the squad. "Of course there will be subtle changes - there will be players coming in and players leaving - but the core group will remain the same." Match ends, Charlton Athletic 0, Bournemouth 3. Second Half ends, Charlton Athletic 0, Bournemouth 3. Offside, Charlton Athletic. Johann Berg Gudmundsson tries a through ball, but Chris Eagles is caught offside. Attempt blocked. Johann Berg Gudmundsson (Charlton Athletic) left footed shot from outside the box is blocked. Corner, Charlton Athletic. Conceded by Artur Boruc. Attempt saved. Johann Berg Gudmundsson (Charlton Athletic) right footed shot from the centre of the box is saved in the top right corner. Assisted by Simon Church. Attempt missed. Callum Wilson (Bournemouth) header from the centre of the box is close, but misses to the right. Assisted by Simon Francis with a cross. Adam Smith (Bournemouth) is shown the yellow card. Yoni Buyens (Charlton Athletic) wins a free kick in the defensive half. Corner, Bournemouth. Conceded by Stephen Henderson. Attempt saved. Charlie Daniels (Bournemouth) left footed shot from the left side of the box is saved in the bottom right corner. Assisted by Dan Gosling. Goal! Charlton Athletic 0, Bournemouth 3. Matt Ritchie (Bournemouth) left footed shot from the centre of the box to the bottom right corner. Attempt blocked. Matt Ritchie (Bournemouth) left footed shot from the centre of the box is blocked. Assisted by Charlie Daniels. Foul by Tal Ben Haim (Charlton Athletic). Substitution, Bournemouth. Kenwyne Jones replaces Yann Kermorgant. Attempt missed. Matt Ritchie (Bournemouth) left footed shot from outside the box misses to the left. Attempt blocked. Dan Gosling (Bournemouth) right footed shot from the centre of the box is blocked. Assisted by Andrew Surman. Tony Watt went off injured after Charlton Athletic had used all subs. Delay in match Tony Watt (Charlton Athletic) because of an injury. Attempt missed. Charlie Daniels (Bournemouth) left footed shot from the left side of the box misses to the right. Assisted by Matt Ritchie. Attempt missed. Joseph Gomez (Charlton Athletic) right footed shot from the right side of the box is high and wide to the right. Substitution, Charlton Athletic. Chris Eagles replaces Frédéric Bulot because of an injury. Substitution, Charlton Athletic. Joseph Gomez replaces Alou Diarra. Attempt blocked. Yann Kermorgant (Bournemouth) right footed shot from outside the box is blocked. Assisted by Callum Wilson. Attempt blocked. Andrew Surman (Bournemouth) left footed shot from the centre of the box is blocked. Assisted by Callum Wilson. Attempt missed. Marc Pugh (Bournemouth) header from the left side of the box misses to the right. Assisted by Callum Wilson with a cross. Substitution, Bournemouth. Dan Gosling replaces Harry Arter. Attempt missed. Harry Arter (Bournemouth) left footed shot from outside the box misses to the left. Assisted by Callum Wilson. Corner, Charlton Athletic. Conceded by Tommy Elphick. Attempt blocked. Simon Church (Charlton Athletic) left footed shot from the right side of the box is blocked. Assisted by Johann Berg Gudmundsson. Attempt blocked. Matt Ritchie (Bournemouth) left footed shot from the right side of the box is blocked. Assisted by Steve Cook. Roger Johnson (Charlton Athletic) wins a free kick in the defensive half. Attempt missed. Alou Diarra (Charlton Athletic) header from the centre of the box misses to the left. Assisted by Morgan Fox with a headed pass following a set piece situation.